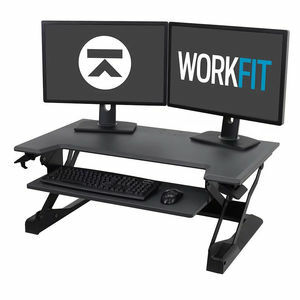 Standing Workstations are a quick and cost-effective way of converting your existing office desk or work surface into a sit stand desk. Standing desks encourage you to alternate position while working which offers many health and wellbeing benefits. 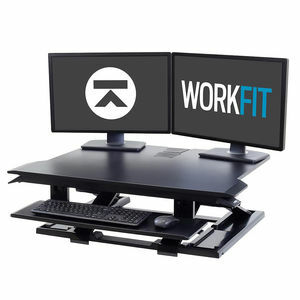 Standing Workstations work straight out of the box with no set up required, so incorporating a height adjustable desk into your workspace couldn’t be easier. Why Use A Standing Workstation? Modern lifestyles have become extremely sedentary. The daily commute, the office desk, mealtimes, unwinding in front of the television and so on... All of these things add up to a huge amount of time sat down, which is bad for your physical and mental health. Bad backs, weakened joints, insufficient muscles, slow metabolism, weight issues, lethargy, lack of concentration and boredom are all side effects of this sedentary behaviour. And evidence suggests that living your life this way could be as damaging to your health as smoking. A short break from your desk combined with a walk will reinvigorate you physically and mentally. This will allow you to reset so you can start working afresh. When you’re working hard it’s easy to forget to rehydrate, which brings all sorts of wellbeing issues, not least headaches, lethargy and lack of focus. Approximately 2 litres of fluid is a recommended daily amount and this includes soft drinks, tea and coffee and fluid derived from food. It’s very tempting to eat your lunch at your desk, especially if there isn’t an obvious place to take your break. However, it’s important to treat this as quality time away from your work. It will allow you to eat and digest your food properly, socialise with colleagues and switch off from work. And if your lunch is a healthier option, then all the better. During lunch, or on one of your breaks, is a great time to do some exercises and stretches. Light exercise will burn calories, get the blood and oxygen flowing and allow you to de-stress. This will allow you to start the next part of your shift refreshed. Ergonomic products can significantly improve your health and wellbeing at work and allow you to perform at your best. 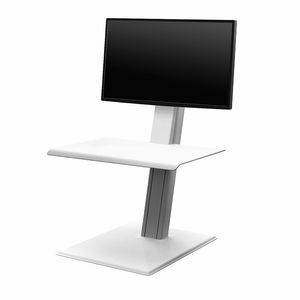 A Standing Workstation could be a significant, yet cost-effective and simple addition to your desk or work surface. 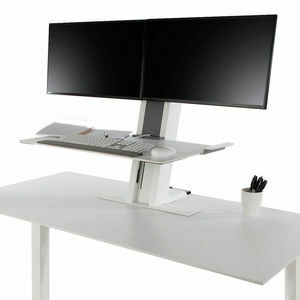 A Standing Workstation encourages alternation between sitting and standing as you go about your daily work routines. This fluidity stimulates blood flow, which in turn increases the oxygen levels in your body. This not only means that fatigue and muscle soreness are minimised, but work capability is boosted with greater focus and productivity. People who have existing back conditions typically find standing desks beneficial. Standing at your workstation helps to elongate the spinal column which is good for posture and reduces strain on the spine and back muscles. Standing at your workstation will also help prevent musculoskeletal health conditions developing in the first place.